With majestic Mount Cheam overlooking Harrison Hot Springs, you’d be hard pressed to remember that you’re in British Columbia and not in some Alpine valley. It is that scenic. Scores of travellers who’ve been visiting this area since the 19th century must have thought so as well, given the popularity of this resort town. 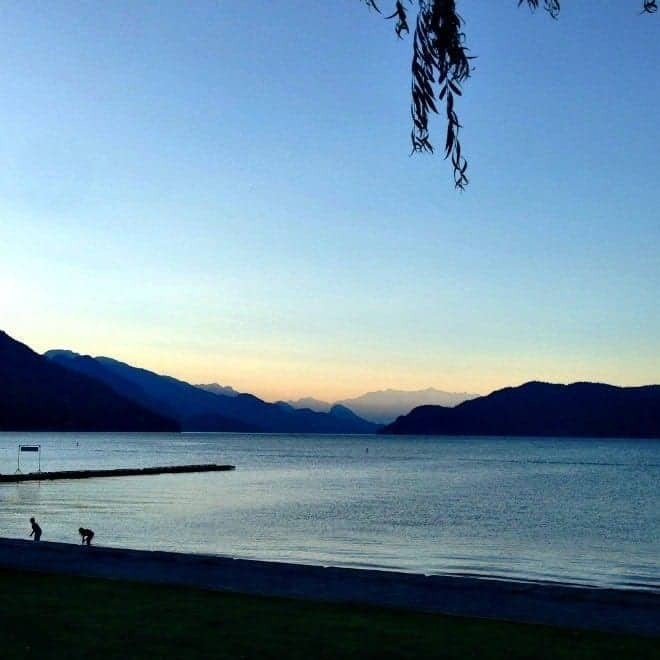 Harrison Hot Springs is an easy 90 minute drive east of Vancouver, along Highway 1. As you pass the urban sprawl of the Fraser Valley, the landscape shifts into the green and scenic farmland of the District of Kent area, including the towns of Agassiz, Harrison Hot Springs and Harrison Mills. It is a delightful part of the eastern Fraser Valley, and worthy of a long weekend getaway. The Resort at Harrison Hot Springs has been well-situated on the shores of Harrison Lake since 1926. The resort hotel complex surrounds the hot springs that first brought visitors to the area in the 1886. If you want to experience the hot springs, you’ll need to stay at the resort. They offer a variety of family deals and packages on their site. There are five hot-spring-fed mineral pools to choose from; an indoor pool (32-35C), indoor hot pool (38-40C), outdoor family pool (28C), outdoor lap pool (28C), and an adult pool (37C). There is also a small outdoor spray park for younger kids, though it didn’t seem as popular as the pools. These healing waters do wonders for the skin and overall rejuvenation. The outdoor setting is well-designed, with views of the nearby forest and mountains, and into the Copper Room dining room. There are no lifeguards in the pool areas, so note that your kids’ safety is your responsibility, as is their behavior. It was blissful to simply recline and relax poolside, with bar and food service just a few steps away. The atmosphere is very family-friendly, as four of the five pools allow kids until the wee hours. Older kids can roam from pool to pool at their leisure, or come and go from guest rooms or the beach while parents soak in the waters and the sun (or shade). The Healing Springs Spa is located near the pool area. The Spa offers romantic couples and girlfriend packages, and includes a large array of massage, facials and body treatments. The Resort is large, with 337 guestrooms located in several wings and towers. Parts of the property feel older, but it has all the amenities you’ll need, such as free wifi. It’s not a luxury property, and that’s just fine, as it also doesn’t have luxury pricing attached to it. You can stay in the original, renovated Hotel rooms (downside: no air conditioning in hot summer), while the West Tower is pool and hot spring-side, close to the action. There are also family (and pet) friendly cottages, built in classic west-coast style. 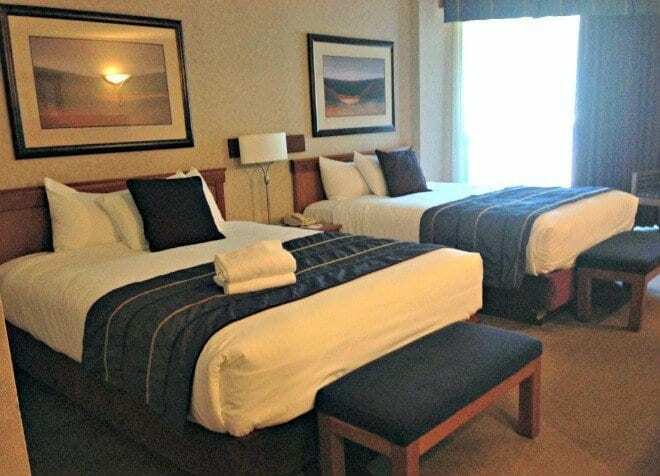 We enjoyed spacious, air-conditioned suites in the East Tower, with views of the mountains, Harrison village and the lake, and with no late-night pool noise. Pool robes and towels are included in the suite, which come in handy when you head downstairs to enjoy the hot spring pools. As the resort parking lot is shared with public day-trippers, there is a daily $20 fee to park overnight. The Resort has a wide variety of dining options. The Lakeside Cafe offers a popular morning brunch, with an omelette bar, hot and cold breakfast items, fruit platters, and baked goods. Grab a table on the outdoor deck overlooking the lake, for breakfast with a view. The Copper Room has a stellar reputation for fine dining, live music and dancing. Its old-school style (you need to get a little dressed up), makes it a special occasion that adds charm to the evening. The table service and high quality, locally-sourced cuisine were top notch. It was obvious that folks come here to celebrate milestone birthdays and anniversaries with friends and family. It’s a room of celebration and tradition, not hipsterdom, and that’s just fine. The live band keeps the room hopping, and though I couldn’t convince my kids to accompany me to the dance floor, they were grooving to the classic tunes, and admiring older couples who knew how to cut a rug. We enjoyed a fabulous dinner of locally-raised chicken, beef wellington, and lamb chops (‘best ever’ according to my youngest). 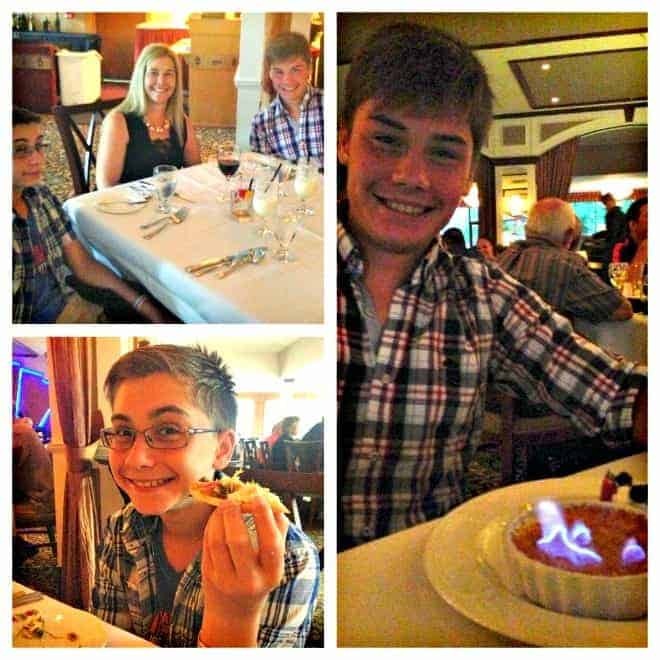 The limoncello crème brûlée flambé dessert put a big smile on my older son’s face. The Resort also has a coffee shop and bar, as well as the Pool Bar and BBQ. Guestrooms don’t have kitchens, but there is a small bar fridge. I noted many guests bring coolers alongside suitcases when they arrived; a practical plan when travelling with thirsty kids. 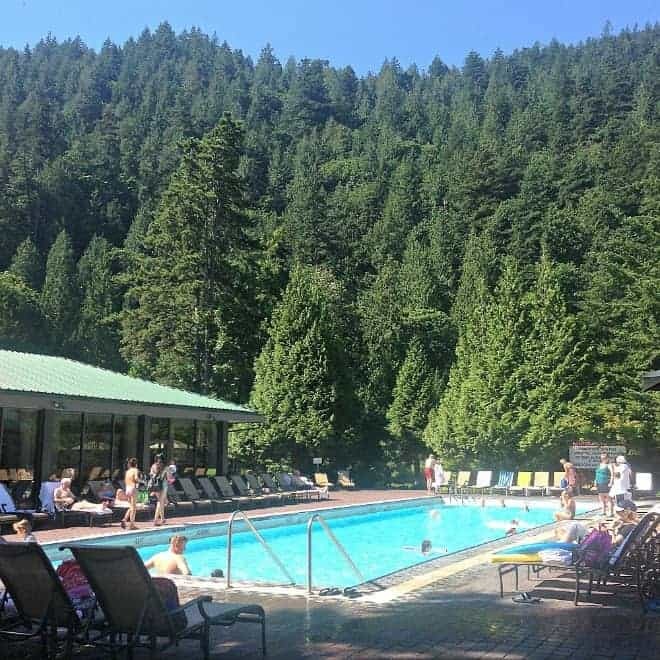 Disclosure: The writer travelled to Harrison Hot Springs as a guest of Tourism Harrison and the Harrison Hot Springs Resort. As always, our opinions are honest and our own. 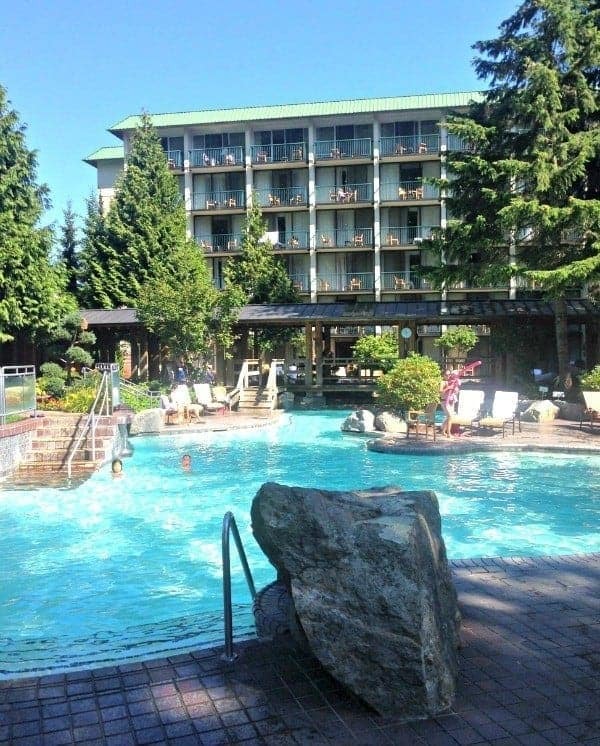 Have you been to Harrison Hot Springs Resort? Share your experience below.